I listened to it when you posted it but i must have forrgotten to reply. It was good. By the way, have any of you seen the original movie about the titanic (without any cheesy love story) called A Night To Remember (which the titles of A Flight To Remember and A Pharaoh To Remember are obviously taken from)? It's old, but it's good. I'm pretty sure "A Pharaoh To Remember" is taken from the movie "An Affair To Remember". Josh, I thought about listening to your song. Does that count? Then you agree with me that The Original Series is the only true Star Trek? The effects are fine so long as they actually help the story and are not used as the main attraction, which, in Titanic's case, was inevitable anyway. In my opinion, the best part of the movie was the soundtrack, which perfectly supplemented the relationship bezoodle and which, when combined with the effects, superbly created the emotional effect for which it was intended. Which was apparently to make me successfully cry. I think I've made myself clear now. That's why I don't read the 'Futurama' Comics. If Leela wants them to be read, put a smile on for smeg's sake. What episode is that grab from? Insane in the Mainframe. She kisses him to shock him out of thinking he's a robot. Almost works. On topic, the shippy part is that she would kiss him even though she just wants to be friends. Also when he smiles and she thinks it has brought Fry back from insanity she's obviously very pleased and smiles that super sweet smile in the frame grab. Well, HipNoJoe, I thought about reading your post with my eyes, but decided to have Windows Narrator read it to me. Hey I liked it JoshTheater! Especially the echo's behind Fry and Leela's voices. This is the official shippers' thread of PEEL. The ''Ship', so to speak, mainly involves Fry and Leela. However, I do believe that there may in fact be too much discussion on this particular couple, to the exclusion of far more enlightening concepts. Allow me to elaborate. 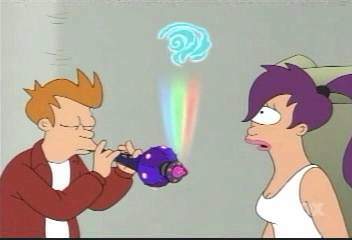 Fry and Leela are a fictional couple. Their liaison is, of course, romantic. But romance is concept that is widely variable from couple to couple, and is based on emotions, which even I don't claim to fully understand. Participants in this thread appear to abhor any palaver regarding any fictional relationship outside of 'Futurama'. I believe this to be a mistake. In order to analyze anything, whether it be emotions, or merely the status of tonight's pot roast, it is required that it be compared with other such examples. In the pot roast's case, you can compare it to a recipe, or if you're like me, compare it to the mental images of all your previously successful pot roasts. In The 'Ship's case, it is necessary to compare it's fictional relationship to others of it's own type, aka, other fictional relationships. It is possible to merely examine other relationships within 'Futurama', but this idea has numerous flaws. For one, no other relationship is as involved; two, they were all written by the same writers, thusly, any unrealistic or misleading flaws will be duplicated in them as well. It's like a gene pool. If there's no variety, you get inherited lunacy. So the Fry and Leela 'Ship must be compared to other fictional relationships, while avoiding those which match the flow to closely. Keep in mind though, if you're going to be comparing Thing One to Thing Two in order to gleam morsels of insight into Thing One (which is what university campuses are supposed to be for), you must have Thing Two analyzed to as much detail as Thing One. You can't rub diamond against graphite and expect the diamond to chip. Therefore, a most productive activity for this thread to engage in would be to purposefully analyze other fictional relationships one at a time, for a minimum of, say, four to five pages each. Then, we compare similarities, insights, and other emotional universalities that we find appear to span time, death, space, and reality. And that may be exactly what we need to understand what it is we seek. And at least we'll be more worldly. So, first in my justification on how the Jack/Rose 'ship is the most romantic/tear-inducing/tragic/emotional 'ship ever, I would like to point out that it is not a treason unto Fry/Leela at all. Allow me to explicate. A movie has four major external elements which contribute to it's success. In order of importance, they are: Writing; Acting; Music; and Effects. Let's analyze these, shall we? Writing: Some movies stop at this stage and never go farther. They've been successful for hundreds of years before movies were even invented. They're called novels. Acting: Great acting is needed for a movie. Many movies lack this. Shakespeare was fantastic, and all he had were these first two elements. Effects: Most disputed item ever. Rarely ever needed in great art. You can see for yourself in stage plays, and of course, Star Trek (The Original Series). However, sadly, it's become more and more a part of cinematography to make the effects, however subtly, the main attraction. This cannot be acceptable. Can the main feature be writing? Yes, it often is. Acting? Certainly, if it's good acting. Music? Pfut! Is Paris a kind of plaster? Go see 'Singing in the Rain', for putty's sake! But effects? No. Certainly never. Now let's analyze the relationship of each of these to that of 'Futurama' and 'Titanic', respectively. Futurama's Writing: Series Comedy. Must be funny. Also, any long term emotion liaison must be entertaining, as well as realistically suspenseful and drawn out over time. Futurama's Acting: Animated. Not relevant. Futurama's Music: Series. So, music-wise, pretty much limited to what's already out there. But 'Futurama' does have it's own groove master, and he's fired up some action-packed and emotional hits. Titanic's Music: Historical Romance Tragedy. Excellent job done here. All original score. All pieces played throughout the film tie together in such a way that they almost tell their own story. Music is reminiscent of the past and present period, but not so much that it exaggerates the eccentricities of either time. It's... Real. Did a very good job of not falling into any of the standard potholes regarding this, they did. And it makes me weep. What else can do that? Futurama's Effects: Animated Series. Not much to be expected, but the 3-Dimensional geometry? I don't think any of use were expecting that! Titanic's Effects: No class for this, really. The 'Titanic''s effects had to be good, because the director knew that many people would come and see it only for them. The Titanic, for some reason, had some majestic beauty that the RMS Olympic never did. But why, you ask? Why the incredible visuals? Well, James Cameron, the director, still had to think about the film's profit. And he knew that as long as the effects didn't become the main artistic attraction of the film, they would be acceptable. In fact, they could help it superbly. And so they did. He was able to bring in the story lovers, the acting gurus, the music listeners as well as the curious who just wanted to see what the ship looked like, in detail. It appealed to everybody. And isn't that the definition of a good film? In summary, 'Futurama' and 'Titanic' hardly differ in terms of quality, except for the obvious difference that 'Futurama' is a television series. 'Futurama' relies on a technique that works and always will work, namely, writing. It is very rare to find that nowadays. But what is even more rare is that one particular work can include all four elements, all in perfect balance, qualities, and quantities. 'Titanic' may be one of the most decorated and elaborative movie of all time. But that doesn't mean it doesn't deserve it. Now, these are just the external elements that make a good film. The internal elements, such as comedy, romance, suspense, action... They're another analysis altogether. But most of these internal elements involve relationships between people. And relationships between people are what we study here, right? Lamps on lifeboats is such a tidbit... And I thought no one knew what happened to Murdoch anyways... just like no one really knew what the captain did with his final minutes. The romance writing in Futurama I thought was brilliant though. It's not the rich girl, poor boy cliche with the uncaring finance standing between them. I remember when I first watched "Love and Rocket" and was not expecting Fry to actually find the heart with the right words. Or that he would find it, Leela would see it and be nicely shocked, but the audience wouldn't be told. But the writers were clever enough to find that perfect heart and I was pleasantly suprised. Well, playing devil's advocate, a bothering aspect of the Futurama romance is it seemed to me to be too dragged out, with the shows in season four coming way too close to hooking up at the end to go back to "I'll never date you" at the next episode. a bothering aspect of the Futurama romance is it seemed to me to be too dragged out, with the shows in season four coming way too close to hooking up at the end to go back to "I'll never date you" at the next episode. Yeah, but that never bothered me too much because I loved the endings of each shippy episode. And kind of figured they were saving it for the finale. Yeah, I understand that, and I loved those endings too, I just wish those endings had more of an impact on the following episodes, even just subtley. More or less, each show needs to follow another, not exactly, but should at least have main stable plots. I would hate the show if it didnt follow up from one another, like a Loony Toons cartoon.. but I've read enough fics to keep me satisfied with what happens after "The Sting" to the beginning of "The Farnsworth Paradox". Hopefully you understand what I mean. This is regarding the Leela/Fry ship. Personally, I reckon by the new episodes, Fry and Leela would have broken up again so that the writers can continue to milk the Fry/Leela shippyness some more. You're stupider than I tell people. 'Titanic' is not cheesy or cliché. Your mind makes it that way. Allow me to help broaden your narrow brain, and let's hope it doesn't break in the process. Cheesy (ch&#275;´zé), adj., cheesi·er, chees·i·est. 1. of or like cheese. 2. Slang. of substandard quality. -- chees´ily, adv. – cheese´i·ness, n.
Obviously, definition two is the one you're referring to. 'Of substandard quality', it says. Well, why, you say? Because the dialog is cliché? Well, let's dive this into thought, shall we, and hope you don't get lost. Cliché (kl&#275; sh&#257;´, kli-), n. 1. a trite, stereotyped expression that has lost it's originality and impact by long overuse, as strong as an ox. 2. (in art, literature, drama, etc.) a trite or hackneyed plot, character development, use of form, musical expression, etc. 3. Print. Brit. a. a stereotype or electrotype plate. b. a reproduction made in a like manner. -- adj. 4. trite; hackneyed; stereotyped; commonplace. [< F, ptp. of clicher to stereotype] —Syn. 1. platitude, bromide. Once again, obviously, definition two is what you're referring to. You must be, because only definition two applies to, quote, 'art, literature, and drama'. So, you're saying we have 'a trite or hackneyed plot, character development, use of form, musical expression, etc. ', are you? Not a very inviting prospect, is it? So, in accordance with the mantra of eschew obfuscation, espouse elucidation, let's analyze! 'a trite or hackneyed plot': Of course! Like we don't already know how it's gonna end. Well, if you go in with that mindset, of course it'll seem 'substandard', or what you say?... 'Cheesy'. But don't blame them for this. Just because you did your research and spoiled the ending is not their fault. And so what if some of the lines contain foreshadowing? Well, of course those lines are going to be 'cheesy', so you say! Until you rid yourself of your stuck up attitude of 'I know what's gonna happen, all this suspense is stupid', and can put yourself into the frame of mind in which you watch the film over and over again and yet still hope and pray that it'll turn out differently, you're not going to be able to appreciate it one bit. So don't judge it until at least you have seen it the way it was meant to be. 'character development': It's love story, you nincompoop! Like that's original! Of course it'll look obviously cliché unless you seek out that which is original! A story of a forbidden love! Oh, no one's ever done that before! And, I admit, there is some desire to see the entire movie as a ripoff of it's many, many predecessors. But this must not be done, for the characters and their behaviors are entirely original. So what if this group of people decides to work together on making an old, old idea into brand new story? And you say their creation is 'cheesy' because it's based on this old, old, idea? In short, you have the Titanic disaster cliché, hence the perceived yet nonexistent foreshadowing clichés. Then you have the love story clichés, which when you force yourself to see spoil the entire experience. Then you have the fact that romance aboard the Titanic is nothing new, so you bind yourself up in this invisible box of disapproval as well. Not even giving it a chance, are we? 'use of form': Well, this is definitely not cliché! Have you seen the cinematography? Have you seen the work that went into it so you could label it 'cheesy'? 'musical expression, etc. ': Ho-he-heh! Excuse me while I tie half my brain around my back to make this even. The music is undeniably the most original and creative and emotional part of the movie, and if you dare call it 'cheesy', I will make sure you learn the meaning the word by suffocating you with a fifty pound round of good 'ol Vermont white cheddar. So ends your intellectual Nirvana. Now for some discussion of romance in 'Futurama'. First, let take into account that 'Futurama' is both a series, a comedy, and a social commentary on human nature. Then, we can come up with some general rules on how any particular romance will flow. From a series point of view, a long lasting romance will have to happen gradually. Not to slow, not all of the sudden, and not at such a rate you're saying 'Come on, already!' One of the downfalls of a series is not properly handling the overall story arc. Either you do it wrong or you do it right. J. K. Rowling did it right. She had the entire 'Harry Potter' series planned out from the beginning. She stuck to her arc. Nothing happened too fast, nothing happened to slow. It was constant in both consistency and flow. Sadly, most series do not follow this, and instead pile their very best into the first few installments, then keep adding second-rate continuations. In terms of series, I'd say that 'Futurama' deserves an even 'Exceeds Expectations'. In the first season, they got us acquainted with the setting and the characters, in the second season they hooked us on the humor, and in the third season they got us seriously hooked on the characters. However, in the fourth season, they got rushed. I'm not saying this was entirely bad; it did give us a good deal of concentrated quality; however, it did disrupt the flow. So where the romance will end up is now somewhat foggy when analyzed from this angle. All I can say is, it'll take a movie or two to get back onto track. And I dearly hope that they don't skip over this matter. I don't want the show to stoop down to the level of a 'Red Dwarf'-style reset button. From a comedy point of view, a romance will have to be entertaining, far more than it has to be realistic. Not to say it can't be bittersweet at times, but overall, you can't have anyone seriously hurt over it by the time the credits roll. But on another issue, do keep in mind that comedy is the enemy of consistency. We, well, I for one, do not want the writers to get so carried up in the comedy that they forget the series, the characters, or the social commentary. And finally, from a social commentary point of view. Yes, 'Futurama' is a social commentary, much like it's distant relative, 'The Simpsons'. However, 'The Simpsons' comments on life today. 'Futurama' comments on human nature. Yes, a commentary on human nature. Television has needed one ever since 'Star Trek' began dwindling away in the 60's. A decent commentary of human nature. As merely one example of 'Futurama''s deepness, consider loosely interpreting the Planet Express crew as elements of a human psyche. Fry represents the impulsive part of ourselves, but also the part which has sudden deep insights into things. Cares for others, but often forgets to look ahead. Primary source of emotions. Often illogical and extremely naïve. Leela is the part of us which makes decisions and actually does things. Primary source of reasoning, but also of rationalizing irrational behavior and desires. Bender is the selfish part of us, the part that distracts the easily distractable 'Fry' component of our mind, and urges the 'Leela' component to rationalize acting selfishly. It's interesting to note that Bender is a robot, and therefore mostly indestructible. And so is the selfish portion of our mind. We can't get rid of it; it's always there and always will be there. But if we were to decide to give it total control over our actions, what would happen? We would destroy ourselves. Remember 'What if Bender were human'? His own vices killed him. He had no self-control. And neither would we, if it weren't for our emotions (Fry) and our noesis (Leela). The 'Bender' component of the human mind has effectively given up full control in exchange for indestructibility. And that's where the the other two components come in. In the human mind, the 'Fry' component and 'Leela' component work most effectively hand in hand. Literally, if you care to think of it that way. 'Leela' would not have any guidance without 'Fry', she would just be a mindless automaton. And 'Fry' would be jibbering idiot trying to grow turnip farms off the coast of Alaska without 'Leela' to point him right. And, like I said, 'Bender' urges them both to comply with himself. Alone with 'Fry', he'd be able to confuse the guy into following him. But reason (Leela) is 'Bender''s enemy. 'Leela', in the end, has control over him. And in the actual show, without Fry, Leela would still be in a job she hated at the Cryogenic Lab. 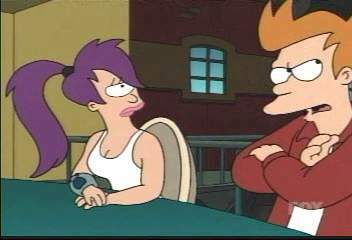 Without Leela, Fry would have probably met Bender alone, who would have convinced the naïve bloke to follow him. And they'd probably end up harming themselves permanently. But together, who does Bender fear being caught by the most? Leela. Selfishness fears naught but reason. And so together, all three of them, they make practically a full person. Now, if you wanted to construct an ideal mind, what would you do? Bring 'Fry' and 'Leela' together? Would 'Bender' have any motivation to bring this 'Fry' and 'Leela' together? Think about it. And do so well, would you? The Intelligent, Long-Winded Shippers' Discussion Thread has been dying ever since it's first reincarnation. And Shiny's disappearance. Post Script: I do agree that no one knows for sure what First Officer Murdoch did during his final moments. But saying that he committed suicide is a wee bit disrespectful, isn't it? Post Post Script: No offense, fryandlemon, I just had to say what was on my mind. Xanfor! Seriously, he just pontificated all sorts of things that have been bouncing around my in the back of my head, but unable to be expressed. And yet, my heart continues to throb on the romance portion of the series, sometimes more than the comedy part. Is that bad? Hey, I have an idea. How 'bout you all pretend you're giving Fyr or Leela dating advice for getting the other to go out with them! That way I can laugh at your pathetic lives even more! Muahahaha! Just kidding. You guys are alright. 'a trite or hackneyed plot': Of course! Like we don't already know how it's gonna end. Well, if you go in with that mindset, of course it'll seem 'substandard', or what you say?... 'Cheesy'. But don't blame them for this. Just because you did your research and spoiled the ending is not their fault. And so what if some of the lines contain foreshadowing? Well, of course those lines are going to be 'cheesy', so you say! Until you rid yourself of your stuck up attitude of 'I know what's gonna happen, all this suspense is stupid', and can put yourself into the frame of mind in which you watch the film over and over again and yet still hope and pray that it'll turn out differently, you're not going to be able to appreciate it one bit. So don't judge it until at least have seen it the way it was meant to be. Are you talking about only the romance aspect here? Or the whole tragedy? Because though I knew what was going to happen with the ship, there was little flaw in the writing there. But the rich girl, poor boy has been done so many times... I just said the romance writing aspect was cheesy! I said I liked the romance! Read the whole post before getting so upset! I was only commenting that I though it foolish to give the writing of the romance 5 stars(or hearts, whatever). It does not deserve all those. The romance writing deserves maybe a 3. It did what it wanted and needed, but in a somewhat uncreative way. Have you seen my previous post that said I loved the special effects and look of the whole movie? Have you seen the whole post you're quoting and the fact I never said the cinematography was cheesy? I thought it was awesome! That's one of the main reasons it's one of my favorite movies! Oh Xanfor, DO show me where i said the music was cheesy. Please. I'd like to see. Unless that part wasn't directed at me of course. Seriously. I was ONLY commenting on the romance writing and the fact I thought you rated it rather generously. I said I liked the romance! Read the whole post before getting so upset! I was fooling with you. Read the whole post before getting so upset! Yeah, but what was on your mind was rather harsh! Plus people always say "no offense" just before something rather offensive. I always get upset when someone misreads my posts. one of my biggest pet peeves. But the initial annoyance can easily be abolished with even the slightest amount of shippy. "If you ask me you shouldn't care what other people think!" Wow...that framegrab is so insanely shippy looking...NOT! what are you talking about JT? don't they just look like they're about to run into each others arms, get married and live happily ever after? 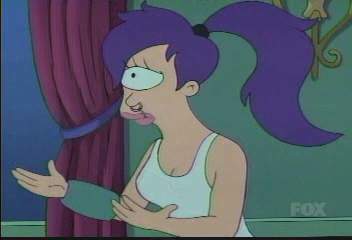 It's from the scene where Leela's thinking about eye surgury and Fry's the ONLY one who wants to her to stay just the way she is. He thinks she looks perfect already. and of course can't resist throwing her arms around him. I knew what scene it was. It just wasn't a shippy grab...the above is though. New anecdote: Fry thinks it's okay to stalk Leela; you can't spell shippy without spy. Dang, even random dude in the background knows there's something between them. Hermes seems freaked out, though. Zoidberg looks like he's stoned in that picture. Perhaps you would find it in your quartz oscillator to discard what you believe to be righteous anger after I clarify myself in the following manner. The large bulk of criticism in my above post is not directed at you at all. I had merely started writing that 'I didn't really see any rich girl/poor boy clichés, and was hoping that you could elucidate me', when suddenly I found myself writing a retort to every single person I'd ever heard criticize 'Titanic' in my entire life. And then, things led on and on and on, and suddenly I found myself spouting prospective character interaction analyses. Which, by the way, would have never occurred had you not inadvertently triggered me into state of emotional ranting. And now she's missing! Whaaaa!!! a) Select 'a' if you want Xanfor to post a shippy framegrab! b) Select 'b' if you want a shippy fanart by FemJesse! c) Select 'c' if you want Xanfor to post a shippy suprise in his fanfic thread! d) Select 'd' if you want Xanfor to never post in this thread again! I'll take B. I haven't seen an FJ Futurama pic in a while. Er, other than my avy, of course. B, definatly B! Nothing better than good shippy art. And... Shippy suprise... I, mean, what? What's next? I can't seem to think... Oh, wait, something to do with suprising... Something to do with... Oh, this! Yes, yes, that, of course.